“Adrift is my abstract interpretation of small creatures on the sandy bottom in the Caribbean Sea during a recent dive trip to the Yucatan Peninsula. Flow is an important quality of life. In yoga, I bring flow and breath ‘to the mat’. 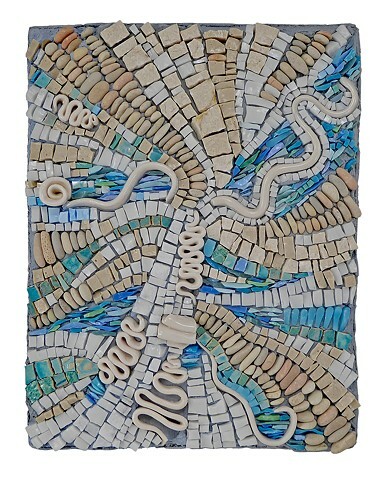 Known in the art world as andamento, flow is also regarded as a very important quality of good mosaic art. Creating worthy art that displays proper flow from disparate objects gives me immense satisfaction.